Overall I’ve been pretty skeptical of the hype surrounding healthcare startups that try to emulate Uber. The skepticism isn’t necessarily at the business model, it’s the hype in the valuation and how the startups will “change” medicine that gives me pause. No — having a physician do house visits or using an Uber style pool isn’t going to “fundamentally” change medicine. This is the same as concierge medicine but with window dressing. It’s a business model that will work because there are enough affluent people who won’t want to wait in a physician’s office and want a doctor at their command. Due to the silicon valley bubble, I’m sure investors who have no idea how healthcare really works will pour millions upon millions into round after round of funding — and come up with companies that do cool things and eventually make a profit — but it won’t be anywhere close to the hundreds of millions or billions they will be hoping to make. I think I’m starting to see more legitimate healthcare innovation happening away from silicon valley because of how out of touch so many there seem to be. I wasn’t surprised that the first app that connected universal wearables to a large hospital system was located on the East Coat. All this doesn’t mean applying certain “Uber” techniques to healthcare won’t work at all. That’s why a recent app just launched out of Australia that is aimed to disrupt the Locums industry is a great example of legitimate innovation. While the general public doesn’t know much about the Locums industry, there is a great chance you at some point have been treated by a physician that was hired using one of these companies. Locums companies operate to fill in hospital staffing needs — from physicians to nurses. This happens a lot more often than people think — such as when a physician is going on vacation, or when a hospital is having a tough time replacing a physician. When you speak to most hospital executives or department heads — you get the sense that locums is a necessary evil. The companies charge huge fees, and many feel the companies are more interested in filling spaces with warm bodies then matching people with the culture or brand of a hospital. Locums is a billion dollar industry — making it a billion dollar middle man ripe for disruption. Doctors For Australia has a simple mission. Connect hospitals with physicians directly. They want to cut out the middle man. 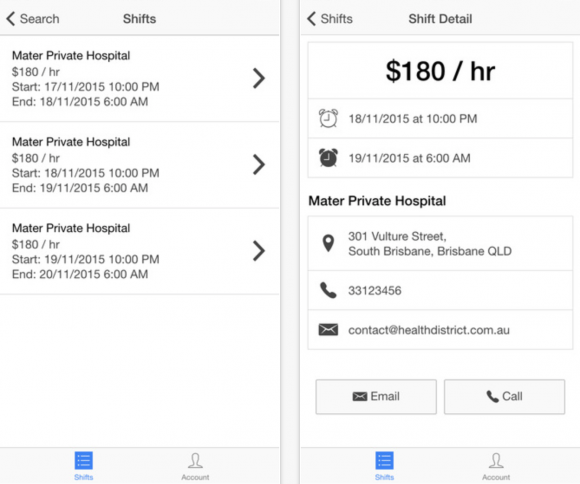 Hospitals can post the immediate shifts they need working on Doctors for Australia, and doctors who have been vetted are able to apply for those temporary jobs. Once a physician creates an account, they have to be confirmed through the AHPRA (Australian Health Practitioner Regulation Agency). In 2008 the Council of Australian Governments (COAG) established a single National Registration and Accreditation Scheme for registered health practitioners — this is what the AHPRA utilizes to confirm physicians before they can sign up for work at hospitals. The elephant in the room hindering this from immediately happening in the US are the numerous disparate state and federal licensing issues — but it’s definitely not insurmountable. While building a platform that crosses states might be difficult, a more regional app would be easier to pull off. It’s nice to see real healthcare disruption taking place using techniques from Uber.